There’s one thing professional genealogists — and their clients — both need to understand and understand thoroughly: there are codes of ethics that govern the way a genealogy business is to be run. So… if you’re a professional genealogist, or an aspiring professional genealogist, or the client of a professional genealogist, or an aspiring client of a professional genealogist, how do you figure out what those rules mean in real life situations? Where are the ethical pitfalls of professional genealogy? 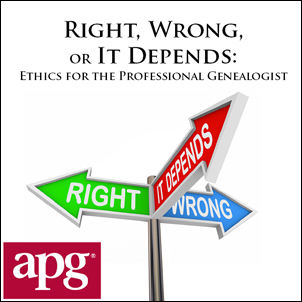 Courtesy of the Association of Professional Genealogists, I have the honor of facilitating an exploration of those issues tonight in a free webinar: Right, Wrong, or It Depends: Ethics for the Professional Genealogist. Though the emphasis will be on what the professional should and shouldn’t be doing, those of us who hire APG members and other professionals can learn too. And these, after all, are the rules we should follow even when we’re just helping out a friend. The webinar will start at 9 p.m. Eastern (8 p.m. Central, 7 p.m. Mountain, 6 p.m. Pacific), and though it’s entirely free, registration is required. There are a few seats left, so take advantage of this educational opportunity from APG. After tonight, it’ll be available only in the members-only section of the APG website. Hope you’ll join me and APG tonight. I discovered your website and been reading it for a few weeks now. The webinars look amazing for avid genealogists like myself. Please correct me if I am wrong….it seems that all webinars are audio-based. If so, I am saddened that I am unable to access and use them since I am Deaf. I rely on text-based/caption/subtitle features to be on same page as everyone to access the resources, so it is something to think about perhaps having transcription/text available, not only for Deaf/Hard of Hearing participants, but for everyone who may want to have hard copy handy. You might want to pass that comment on, to Legacy Family Tree Webinars (website contact page is here) and anyone else doing webinars. Are you the Roni LePore who emailed regarding Thomas John Wogan? A Thomas John Wogan was my nephew and I’m curious about the connection. Yes, this is she…Roni Lepore. Pls get in touch with me via email and I am more than happy to share info with u.